And not only do I still feel the waves, my neck was so sore Sat. night I could hardly sleep, spent half off the day looking over my shoulder to make sure I wasn't going to get hit by a powerboat. Crossing the Rideau from one bank to the other was like being a pedestrian trying to cross the 417 during rush hour. Also, by I or 2 the shoreline was so churned up by boat wash there was nothing but mud for 10 or 15 feet. Great tourney, but a nasty stretch of water. how long ottawa to there.? but can take any deal on used ones. by pm please. &nbsp;but could get the natives mariner..as mutch stabile as the pro ...and stay in my veins. again me its to be up that i love the pro....but can get up boats....will see what will happens and what will come up as deals and budget. What did you win for that little lunker joco? a bag full off goodies...t chirts//sunglaces//tons off hobi stuff...stuff i never taugh to get anyway wit a 2 7/8 blugill..ahaha but fun to target the smalles fish and actulay its kind off harder thentry top get the biggest..you need to go real fine and real tiny. but the biggest fish got a real nice paddle worth like 400$ or so plus other stuff. 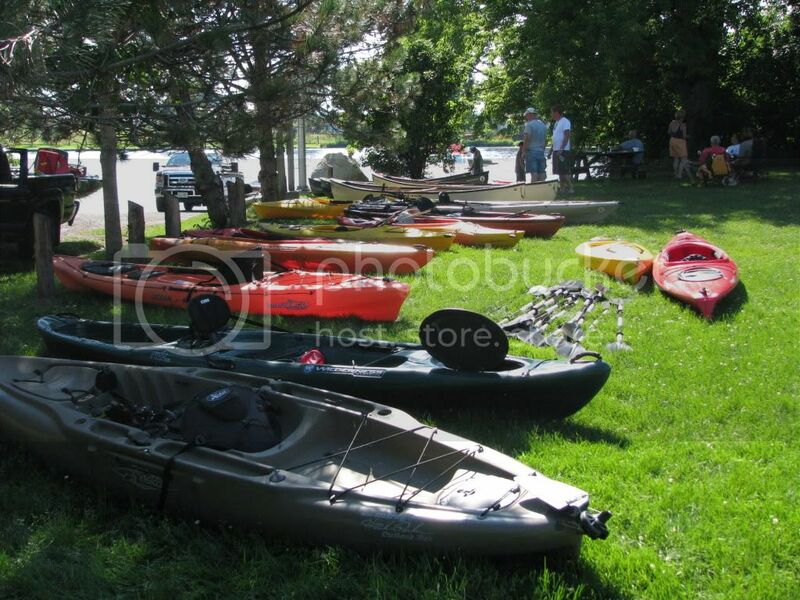 they were realy nice prise..a tule kayak rack were guiving away etc etc. it was nice to see a lot off people going away wit something. again 2 thumbs up to the tam that organise this event. and a big thanks to all that heslp for unload and reload the yak/canoes over there. i manage 3 picture over there thats is it. 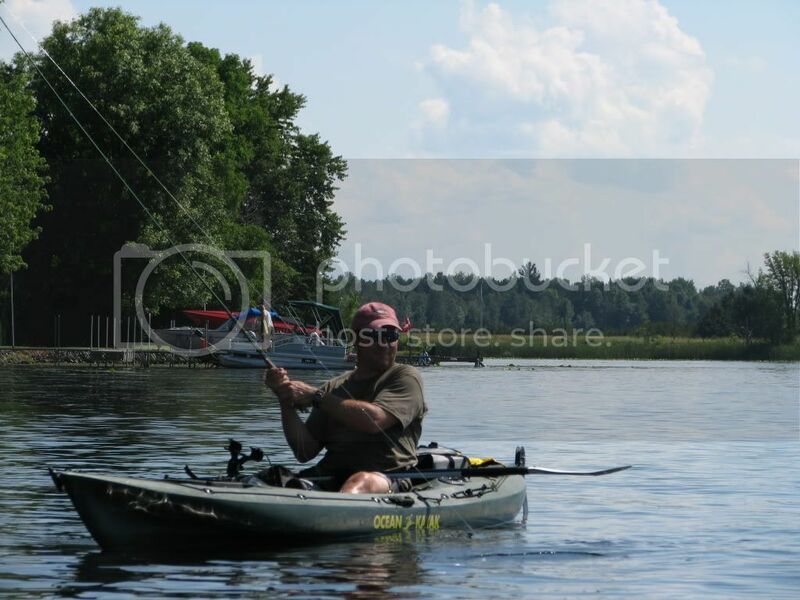 this last one fly anfler in kayak trying everything,,at last few min off the derby we were like 5 kayak fishing at the boat launch trying to get a bigger crappies..that ws funny...and this guy caught a nice bass on fly right ther must been like 14 incher or so. here the yak to try or to rent. I'm out of town and will upload the "few" pics I took later tonight. I helped out with the judging/demo/general lackey side of things and got out in the bitter hot afternoon to take some photos only to find my new Nikon battery got left in the wall charger that morning... I did manage to crack off a couple photos during the day with my almost dead battery... I turned that photo opp into a fishing opp and caught a small largie and a wee snot rocket for my efforts... found large schools of fish on the channel edges along steeper drops (20+fow) but couldn't entice them with any of the minimal offerings I brought out with me. actualy was the only one that did resiterd fish in 1/2 time..so why not go back and beat my smaler one.but backward need smaller. . and try to get bigger..but keep the lead until the end...sher was fun. for the judging partmust be pretty slow before you got away i was the only one that did register 1/2 way and not mutch was registerd after but hey its a job well done. i wish they would have been more registerd actulay. actualy you did sopme saying in this derby to pat thanks..
sorry dont rember the guy..that wont for the logues fish and the biggest bass a bass of 18 inch..
there was NO.pike ..........NO MUSKY........AND NO WALLEYE CAUGHT. SO PRIZE WENT.....BIGGES CRAPPIES...SMAL FISH BIGEST BASS AND LONGUES FISH AND A TONS OFF PRIZE TABLE. SORRY THAT..I CANT REMEMBER THE WINNERS NAME..THE BIGEST CRAPPIES WAS A GUY FROME BELLEVILLE AREA IF I REMEMBER IT RIGHT LIKE 3H AWAY..THE GUY THAT GOT THE BIGGEST BASS AND LONGUES FISH IN THE SAME TIME WAS FROME LABRADOR.IN A RENT KAYAK..GREAT WAY TO GO BACK HOME FULLY EQUIP GREAT PADDLE AND A LOAD OFF STUFF.. IN VACATION HERE ..THIS IS COOL I WAS VERY HAPPY TO SEE THEM WIN THOSE PRIZES. THERE WILL PICT POSTED BY JENDA AND DON I GUES. JOCO.cant wait for neXt year now....a bit hurlyer please..
you should have sens the fight i got....it went airborn 4 time... .
good thing i had my lip gripper.